Sea Otter Management in the U.S. Since the first official legal protections in 1911, the U.S. has made great strides in recovering sea otter populations. While much of this progress is due to increased emphasis on understanding sea otter behavior, biology, and ecology, there are also several policies that have been just as instrumental in making sea otter conservation efforts successful. Here, I provide a brief overview of the current legal and regulatory policies used to manage sea otters in the U.S. and explain why having a base understanding of these tools can help our lab as we look into the potential reintroduction of sea otters to the Oregon coast. When we talk about sea otter management in the U.S., the two most obvious laws that come to mind are the Marine Mammal Protection Act (MMPA) and the Endangered Species Act (ESA). In short, the MMPA seeks to prevent the take – including kill, harass, capture, or disturb – or importation of marine mammals and marine mammal products. While the ESA seeks to protect and recover imperiled species – not just marine mammals – and the ecosystems which they depend upon. Both laws are similar in the sense that their primary objectives are to protect and recover at-risk species. However, marine mammals will always be protected under the MMPA, but will only be protected under the ESA if the species is considered threatened or endangered. On the federal level, the U.S. 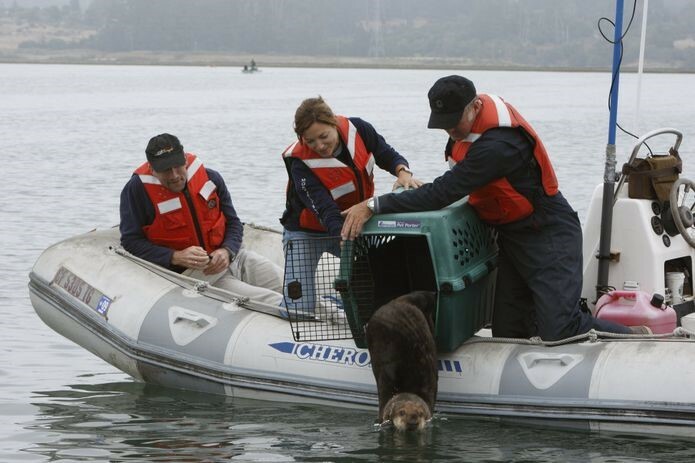 Fish and Wildlife Service (the Service) is primarily responsible for managing sea otter populations. 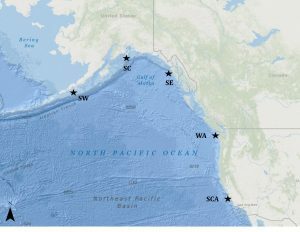 In the U.S., we manage sea otter populations as five distinct stocks, which differ in their population size and geographic distribution – located in California, Washington, and Alaska state waters (Fig. 1). Because sea otters are divided into these single stocks, management decisions – such as recovery targets or reintroductions – are made on a stock-by-stock basis and are dependent on the stock’s population status. Currently, two of these stocks are federally-listed as threatened under the ESA. Therefore, these two stocks are granted protection under both the ESA and MMPA, while the remaining three stocks are only protected by the MMPA (at the federal level; state management may also apply). While the MMPA and ESA are important federal laws, I would be remiss if I didn’t mention the important role that state laws and state agencies have in managing sea otters. According to the MMPA and ESA, if a state develops and maintains a conservation or recovery program with protections consistent with the standards and policies of the MMPA and/or ESA, then the Service may transfer management authority over to the state1,2. However, typically, the Service has opted to manage any stocks listed under the ESA, while states manage all other stocks not listed under the ESA. Sea otter management in the states of Washington and California is a clear example of this dichotomy. The Washington sea otter stock is not listed under the ESA, and is therefore, managed by the Washington Department of Fish and Wildlife (WDFW), which developed the stock’s recovery plan. In contrast, sea otters along the California coast are listed as threatened under the ESA, and the Service primarily manages the stock’s recovery. Interestingly, sea otter management in Alaska is an exception to this rule. The Southeast and Southcentral sea otter stocks are not listed under the ESA, yet are still managed by the Service. However, the state recognizes sea otters as a species of greatest conservation need in the state’s Wildlife Action Plan, which acts as a recommendation framework for the management and protection of important species and ecosystems. 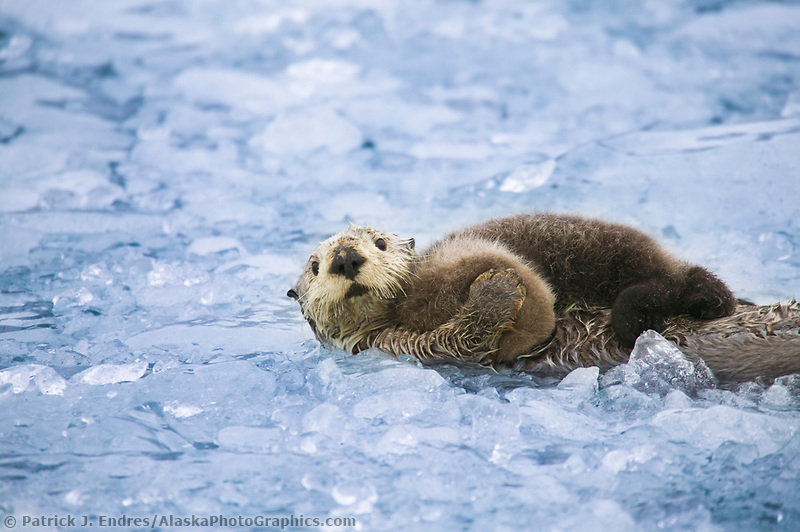 Therefore, even though the state is not the primary management authority for sea otters by law, they still play a role in protecting Alaskan sea otter populations through this action plan. Table 1. 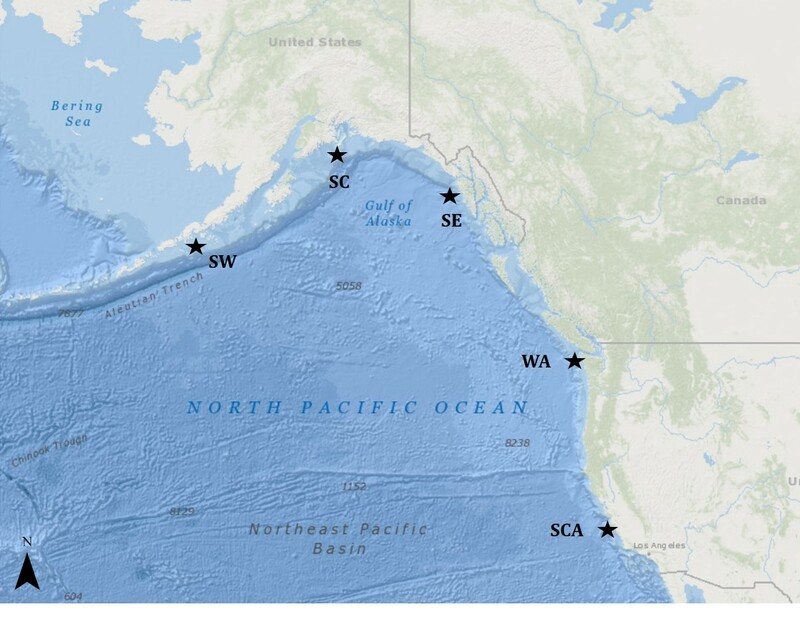 Federal and state listing status of all sea otter stocks within U.S. coastal waters. States have also implemented their own laws for protecting at-risk species. For instance, while the Washington sea otter stock is not listed under the ESA, it is listed as endangered under Washington state law4. 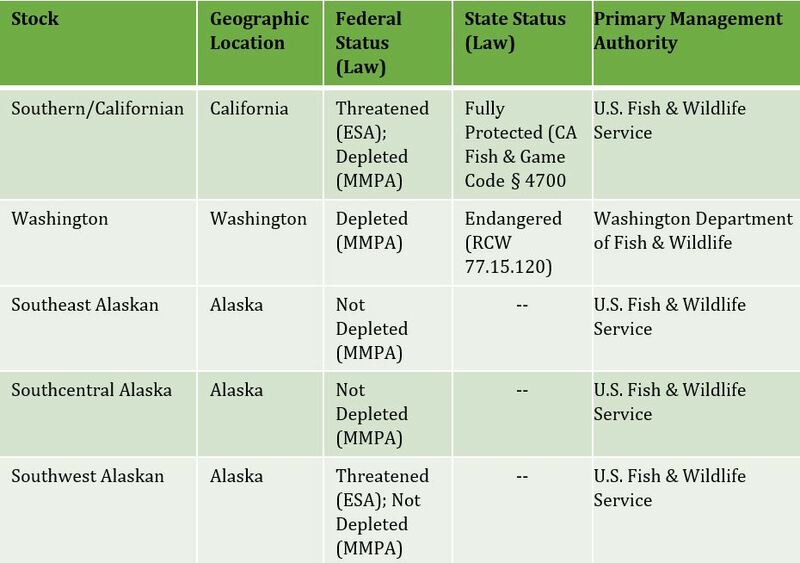 This example raises an important example demonstrating that even if a stock isn’t federally-listed, it may still be protected on the state level, and is always protected under the MMPA. Therefore, if the federal and state listing status do not match, which is the case for most sea otter stocks in the U.S. (Table 1. ), the stock still receives management protection at some level. Each of the previously mentioned laws are prohibitive in nature, where the objectives are to prevent and discourage activities which may harm the stock of interest. Yet, agencies may grant exceptions – in the form of permits – for activities, such as scientific research, translocations, commercial/recreational fisheries operations, etc. 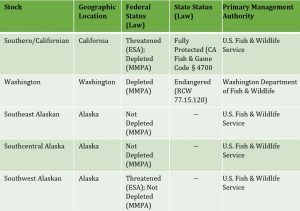 The permit approval process will oftentimes depend on: (1) the severity or likelihood of that action to harm the species, (2) the species’ federal and state listing status, and (3) the unique approval procedures enforced by the agency. Activities that are perceived to have a high likelihood of harming a species, or involve a species that’s listed under the ESA, will likely require a longer and more arduous approval process. A sea otter release in Monterey Bay, California. Source: Monterey Bay Aquarium Newsroom. Understanding these various approval processes is vitally important for our work on the potential reintroduction of sea otters to Oregon because such an effort will no doubt require many permits and a thoughtful permit approval process. Each agency may have their own set of permits, administrative procedures, and approval processes. Therefore, it behooves us to have a clear understanding of these various processes relative to the state, agency, or stock involved. If, hypothetically, a stock is determined as a suitable candidate for reintroduction into Oregon waters, having this understanding will allow us to determine where our research can best inform the effort, what types of information and data are needed to inform the process, and to which agency or stakeholders we must communicate our research. U.S. Fish & Wildlife Service. 2003. Final Revised Recovery Plan for the Southern Sea Otter (Enydra lutris nereis). Alaska Department of Fish and Game. 2015. Alaska wildlife action plan. Juneau.